In an effort to eat less red meat, I have started to eat more fish. I have nothing against fish; in fact I enjoy fish more than red meat for the most part. The problem is that, finding good and fresh fish can often be a challenge. Additionally, the fish industry is very deceptive today. There is nothing wrong with fish raised or caught in the United States; however, we often find that fish found in supermarkets can be from South America or Taiwan. Governing laws in many foreign countries for fish farming is substantially more lenient in methods and sanitation levels. Accordingly, we must sometimes be careful when purchasing fish from foreign countries. Not only are domestically raised and caught fish more sanitary, you are also supporting domestic fish farms and fisherman. That aside, over the last month I have made three different fish dishes. 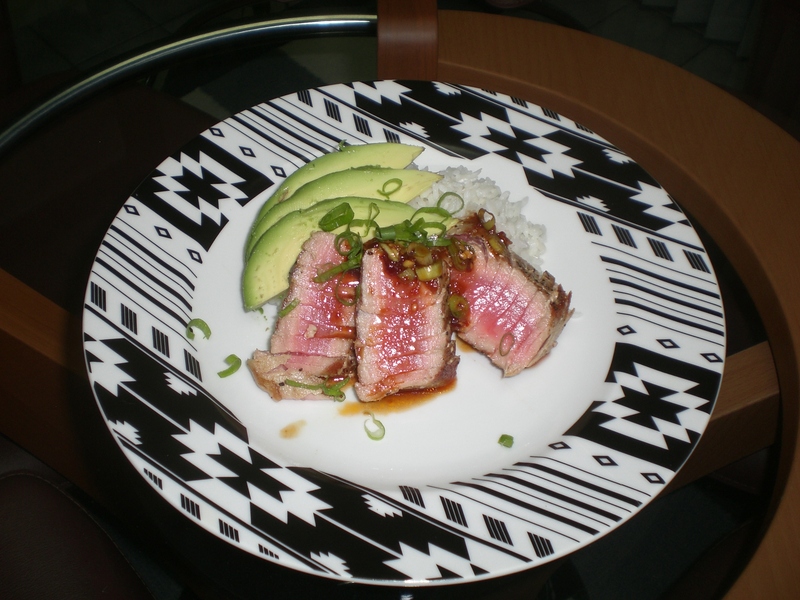 The first dish I made was Seared Tuna with a Soy Chili Sauce. The tuna was allegedly “Ahi” tuna that was frozen at sea, purchased from H-Mart. Let me start by saying I have eaten real “Ahi Tuna” before, and this was far from it. Ahi tuna is usually fairly firm and is a dark red color when raw. This frozen product was a light red, almost pink color, even after the artificial coloring added. The fish tasted OK, but it fell apart when it was cut and had a watered down taste, often associated with frozen fish. The sauce I created helped to mask how mundane this tuna was. On a side note, many restaurants (especially chains) claim to use fresh ahi tuna, but make no mistake, the tuna in chain restaurants is usually not fresh, and almost definitely not ahi. 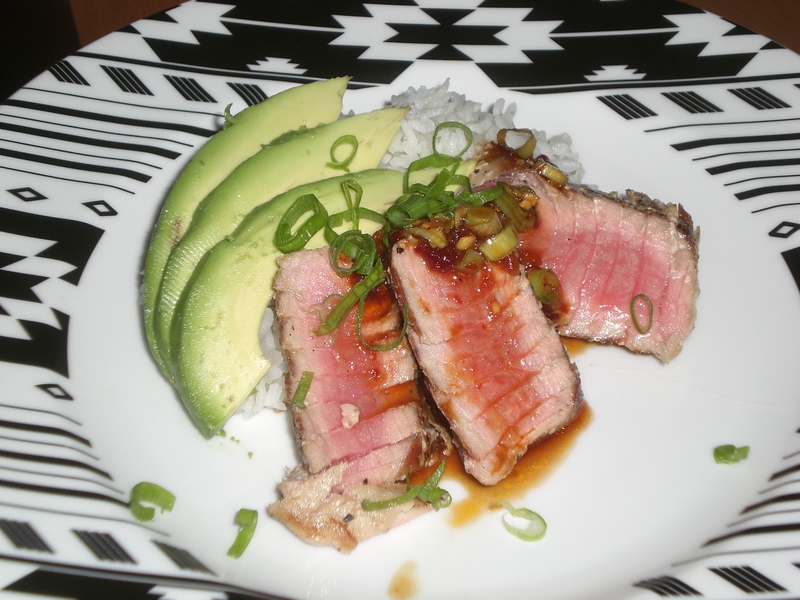 My advice is stick to fresh, never frozen, ahi tuna when you want to make seared tuna at home. The ahi tuna at Wegmans is hands down the best. Although pricey, it’s guaranteed to be fresh, and will always smell like the ocean (a very good sign). My other fish experience this week was Halibut from Fresh Market. The halibut was “frozen at sea”. I actually believe that the fish was frozen at sea, unlike the tuna. Although the fish was frozen, it still maintained its texture before and after cooking, and it wasn’t watered down. The filet was an overly long cut of halibut which made cooking a bit trickier. I started by seasoning the fish with salt and pepper and then placed the fish flesh side down into a hot pan with olive oil. Once a nice crust was formed, I flipped the fish and then put it under the broiler for eight minutes. 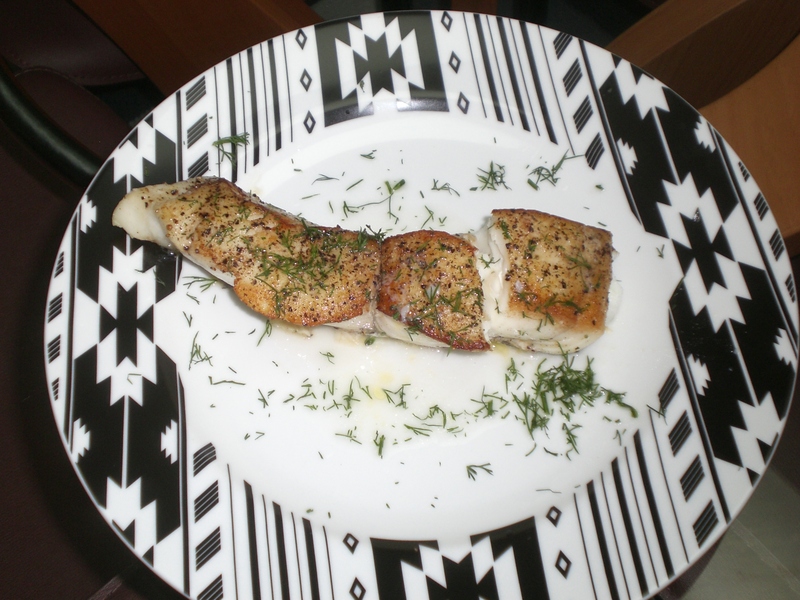 While under the broiler, I made a lemon butter sauce with lots of fresh dill. This dish came out nice, and inspired my faith in Fresh Market’s “frozen at sea” fish products. The third fish dish I made was somewhat more adventurous. 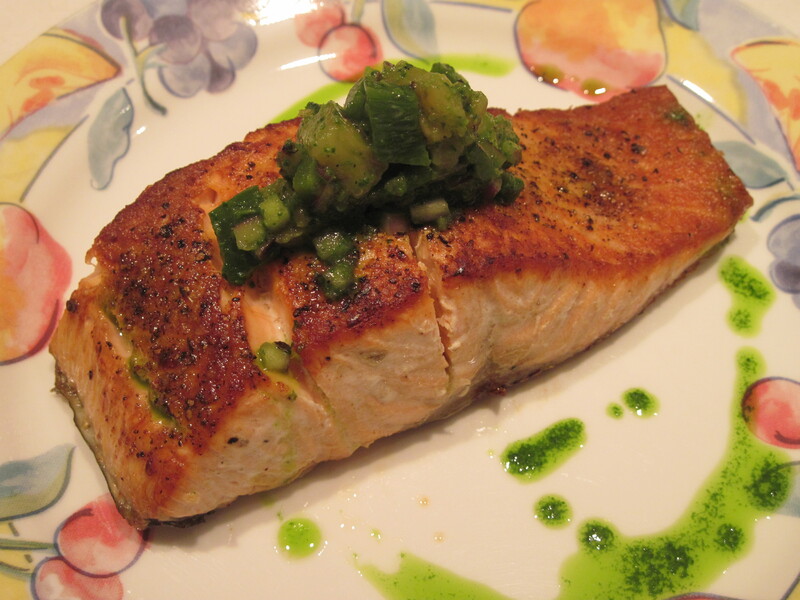 I created an Atlantic Salmon with Poblano and Pineapple Salsa. The salmon was also purchased at Fresh Market and was also “frozen at sea.” I cooked the salmon in the same manner as the halibut, seared and then finished in the broiler. The Salmon got a real nice crust on the outside, which was a nice contrast of texture to the salsa I made. The salsa featured fire blackened poblano peppers and grilled pineapple. I blackened the poblanos and then peeled off the skin. Once that was done, I seeded and diced the peppers into small pieces. I then added the chopped grilled pineapple, along with red onion, cilantro, salt, pepper and olive oil. I finished the dish with cilantro oil. I was very pleased with how this dish turned out. I know this sounds banal but salmon is amazing. It’s a great “go-to” fish when you aren’t sure what else to get. Salmon holds up to mild or bold flavors very well and is always sure to satisfy.